Albion is proud to introduce a new generation of Albion Mark Swords, designed by noted Swedish swordsmith, author and researcher Peter Johnsson, based on his exhaustive research of original swords in museums and private collections throughout Europe. Each sword is a composite of several originals, blending the aesthetics, functionality, and blade design properties into a perfected representative model of its type. Peter's careful study of the originals results in reconstructions of highly defined shape and exquisite handling characteristics. The principles of harmonic proportions, foremost the golden section, are an important design principle that can be observed in historical swords. Harmonic proportions will not only result in attractive shapes, but also help acheive high performance. The swords will all be marked with the Next Generation Albion Mark (above), signifying Peter's design work and oversight of each sword's production. Each of these new Albion Mark swords is destined to become treasured heirloom and valuable collector's item. Blades are designed according to the same principles of proportions and dynamic properties as the historical originals. Edge geometry is established according to original swords of the same type and function. Hands-on documentation of original historical swords in European collections results in designs based on the latest research. 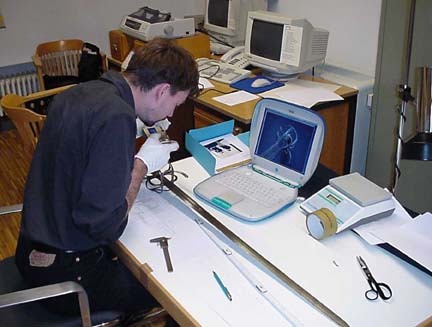 All techniques, designs, and construction methods are developed, established and supervised by Peter Johnsson. Handcrafted finish and fitting, hand-grinding and polishing, all combine into the creation of an heirloom-quality custom level sword. Each sword is individually hand-fitted and assembled, each part hand-finished by the master cutlers at Albion. Every process and part of all Albion Mark swords are entirely "made in the U.S.A" by highly trained craftspeople. All Next Generation Albion Mark sword models will be traditionally constructed, with the guard and pommel wedged into place, the tang hot peened to secure the assembly, and the grip added to the assembled sword as the last step, just as on period originals. This will guarantee a tight assembly that should never loosen or require repeening. From the selection of the steels used, to the design, hand grinding and finishing, each of these swords will share the appearance and functional characteristics common to a period original of its type. Each sword design is subjected to grueling destructive testing periodically to ensure that it meets the high performance standard of the Albion Mark Line . As with all Albion Mark swords, each sword is backed by a lifetime guarantee against defects in materials and workmanship. Sword design/specifications ©2004 Peter Johnsson.